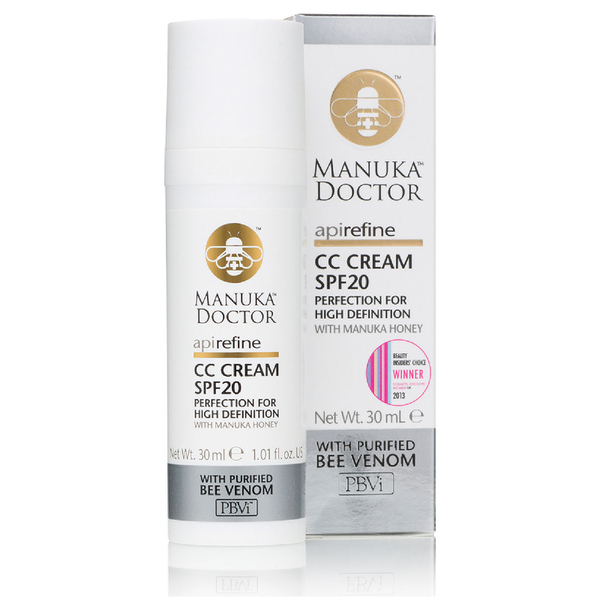 Protect and perfect your skin with Manuka Doctor ApiRefine CC Cream with SPF20, a tinted face cream that works to brighten, even and smoothen the appearance of skin whilst shielding UV rays. Subtly tinted to help conceal imperfections, and fortified with SPF to safeguard from sun damage, the multi-tasking formula utilises Purified Bee Venom (PBV™) and Manuka honey to perform a firming and lifting effect on skin; its tightening properties and dose of Sorghum Plant help to reduce the appearance of wrinkles for a younger, smoother-looking complexion. Infused with a host of beneficial Vitamins and Minerals, the hydrating cream will inspire a beautiful complexion that is both younger-looking and expertly protected. Apply to face and neck for light, natural looking coverage. May be applied under makeup or on its own. Aqua (Water), Caprylic/capric Triglyceride, Octocrylene, Ethylhexyl Salicylate, Polysorbate 60, Ethylhexyl Methoxycinnamate, CI 77891 (Titanium Dioxide), Glyceryl Stearate, Butyl Methoxydibenzoylmethane, Hydrogenated Polydecene, Candelilla/jojoba/rice Bran Polyglyceryl-3 Esters, Glycerin, Phenoxyethanol, Caprylyl Glycol, 1,2-hexandiol, Sodium Acrylate/sodium Acryloyldimethyl Taurate Copolymer, Cetearyl Alcohol, Butylene Glycol, Isohexadecane, Sodium Stearoyl Lactylate, Hydroxystearic Acid, Xanthan Gum, Sodium Polystyrene Sulfonate, Polysorbate 80, Sorghum Bicolor Stalk Juice, Honey (Mel), Ethylhexylglycerin, Sorbitan Oleate, Ascorbyl Glucoside, Olea Europaea (Olive) Leaf Extract, Zinc Pca, Opuntia Ficus-indica Stem Extract, Bee Venom, BHT, Acetyl Octapeptide-3, CI 77492 (Iron Oxides), CI 77491 (Iron Oxides), CI 77499 (Iron Oxides).